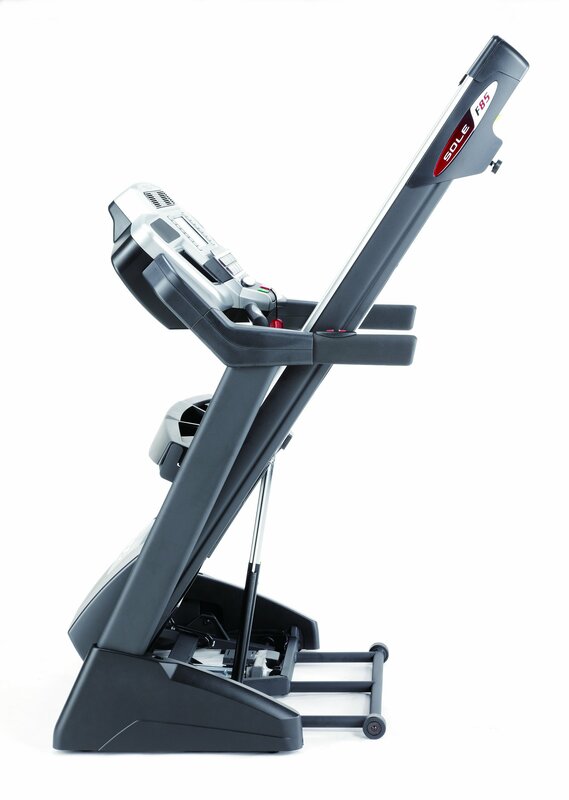 Today we are going to take a close-up look at the Sole Fitness F85 Folding Treadmill. This 2013 model treadmill is one of the top models sold by Sole. The treadmill is 58 inches high, 80 inches in length and 35 inches wide. The treadmill weighs 265 pounds and can support users weighing up to 400 pounds. It has a 4.0 horsepower motor, and a maximum speed of 12 miles per hour. The F85 comes with heart rate monitoring and a total of ten programs for a variety of workouts. Controls for speed and incline are located on the handlebars. On the console, there is a fan and imports for an iPod or other type of MP3 player. Currently on Amazon.com, the treadmill has a “retail” price of $2,999.99 but usually sells at its sale price for $1,799.99 with free shipping. Treadmill is solidly constructed. The frame is durable and made for users of all different weights or heights. This machine is meant to be used frequently. The F85 features a 22-inch-wide running surface. This allows people of all sizes to run, jog or walk using a natural gait. This treadmill folds and rolls. These two features allow it to be more portable and functional in potentially tight-fitting places. Easy to install. Most people have said that it takes at the most about 30 minutes to assemble. A person can construct and use this treadmill in a single day’s time. The F85 model comes with a heart-rate control feature. After inputting the age of the user, the console will suggest an appropriate heart-rate goal for that individual. This helps to ensure that each person using this machine will have the most efficient and safe workout possible. The unit as a whole is very quiet. This allows the user to listen to music or watch television with ease while exercising. This can help motivate even the most unenthusiastic exercisers. Model comes with a safety key that stops the treadmill in case of an emergency. Toward the front of the machine, near the console, there are two armrests to help individuals regain balance if needed. The frame, motor, and deck of the F85 all have a lifetime warranty. The electronics have a five-year warranty, and the labor for the treadmill has a two-year warranty. The console has a blue, backlit screen of nine inches in diagonal length. The print is large, making it easier to read the various forms of data presented on the LCD interface. The display shows information such as speed, heart rate, the number of calories burned as well as other valuable material. The console also has a function called the SOLE Message Board. This feature displays encouraging messages and helpful tips to assist the individual using the treadmill so that he or she may have the most efficient workout possible. The F85 has speed adjustment buttons on the console. However, these buttons go from six miles per hour to nine miles per hour. Some individuals might find this jump in rate of speed to be too much. While the treadmill does have the capability to change speeds, there is a slight, but noticeable, delay when increasing or decreasing the rate of speed. However, some buyers may see this as a safety feature. The delay would give an individual time to cancel an accidental speed change. The pre-assembled unit weighs over 300 pounds. The buyer of this machine should be aware that they might need help getting it moved to the desired location. Even though the treadmill comes with inputs for MP3 players or iPods, there is no volume control on the actual unit. If one wants to adjust the volume, he or she would have to manually adjust the volume on his or her MP3 player or iPod. While there are a few things that could be improved, overall the Sole Fitness F85 Folding Treadmill is a well rounded treadmill that is worth consideration for a personal gym. There are other treadmills that boast similar features such as the LifeSpan TR5000i Non-Folding Treadmill, the ProForm Pro 2000 Treadmill, the Precor 9.27 Treadmill with Ground Effects Technology or the Life Fitness Club Series Treadmill. However, each of those treadmills are more expensive than the Sole Fitness F85 Folding Treadmill. The F85 blends its strength of frame, high-tech design, useful safety features and portability to give its user a well-rounded exercise experience. Very few other machines combine all of these elements, and none of these come at a better cost. The Sole Fitness F85 Folding Treadmill is a luxury machine that comes at a reasonable price.